Cool Collage is a free Windows 8 collage maker app available under ‘Entertainment’ section of its app store. 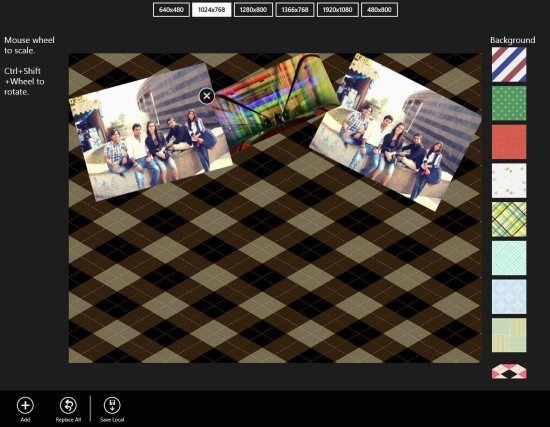 Here, in this collage maker Windows 8 app, you can upload photos one-by-one and paste them on a single background. There is a list of beautiful backgrounds. You can select anyone to make it your collage background. It’s a free style of making collages in different sizes such as 640×480, 1024×768, 1280×800, 1366×768, 1920×1080, and 480×800. Using this Windows 8 collage maker app, you can easily and quickly generate spectacular photo collages by uploading the photos saved in your local picture library. It’s very simple to create a collage via Cool Collage Windows 8 app. All you need to do is just launch the app, select a background (given at the extreme right) ? select a size (given at the top of the screen) ? click on ‘Add’ button to add photos ? adjust photos according to your preferences. Once you are done with all the adjustments, you can now click on ‘Save Local’ button to save your collage to your local machine. During the collage creation, the app brings you instructions to adjust photos and set photos according to your preferences. Let me quickly point out the main features of this Windows 8 collage maker app. Allows you create spectacular collages using photos stored in your local picture library. Lets you upload photos one-by-one. Comes with a list of beautiful backgrounds. Collages can be created in various sizes such as 640×480, 1024×768, 1280×800, 1366×768, 1920×1080, and 480×800. Lets you save a collage in your local machine. Lets you replace all the photos with others using ‘Replace All’ button. Well.. I really liked this collage maker app for Windows 8. You can customize background, rotate, resize photos, comes with high-resolution export, lets you save a collage to your local machine, and many more options. It’s a must trial pack for those Who love to play around with photos. Also, check out our posts on Collage Maker App, Photo Editing Apps, and Turn Photo to Painting. Open the link in IE10. Click on ‘View in Windows Store’ and proceed with further installation steps. You will soon find the app installed and placed on Windows 8 Start Screen. In short, Cool Collage is a good fun Windows 8 collage maker app where you can create beautiful collages and post it your Facebook wall. Go ahead and download Cool Collage app in Windows 8 now.